"Practice love every day. Find some object to love, whether it’s a pet or a flower or an abstraction or a car. It would be better if it were a person. As you practice this day by day, raise the bar. So that practice loving something that’s successively less lovable. Anyone can love a dog, because the dog thinks you’re wonderful. It takes a little more to love a cat, because the cat thinks it’s wonderful. It takes more to love a woodchuck, because a woodchuck doesn’t care one way or the other. It takes more to love a rattlesnake, because you may be afraid of it. You see. So you could easily raise the bar a little bit every day. The practice of love is the practice of overcoming the illusion of distance." RB notes: overcoming the illusion of distance can also be described as overcoming the illusion of separation. Everything is a part of Source. You are a part of Source. Everyone and everything else in the universe is also a part of Source. All is one and there is no distance and no separation. The universe, Source, is a single point of consciousness, a single point of energy. Overcoming the illusion of separation is the true path of realization, where you begin to step into the greater reality and realize that the physical universe is an illusion, a dream, and hence infinitely fluid, relative, and changeable. But here the question arises....who is the dreamer? RB notes: this practice can be made even more powerful if you have someone to work with you. Start a discussion or debate and, halfway through or at an agreed upon signal, stop and swop your points of view. Flexible thinking like this allows you to understand other people better. It allows you to perceive the subject better. It also allows you to understand your self better. In any discussion or debate there are three points of view: yours, your opponents, and the truth. The trick is to hold some space clear where the truth can be heard by all. Because the truth always has the final say. When you are open to this, you are open to growth and learning. A bad energy will appear and it will feel aweful and you will want to lash out or to leave. When this happens, STOP!. 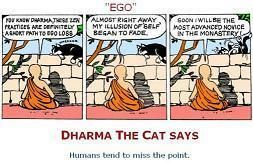 You are encountering aspects of your ego, of your pain body as Tolle would say. This is a critical point. When this happens, get your partner to help you 'hold that space' and observe the energy, the feeling in your physical body. Focus your body awareness on this and just observe the feeling. If you do this for long enough, the energy will dissolve and you will 'grow'. The length of time it takes to dissolve an aspect of your ego, of your pain body, varies depending on the strength of the aspect (or tentacle, as I describe an aspect of ego). The bad energy will tend to shift while being observed. It will go, and then reappear. It will come and go. When it goes, return to the part of the discussion that caused it to arise, and discuss what caused this to happen. Try to make it reveal itself again. It may reappear later while you are discussing dinner, for no apparent reason. Repeat the practice of observing it and 'hold that space'. If you do this, it will dissolve. And when it truly dissolves, you will experience growth. When you experience this type of ego dissolving growth, you may also experience some depression and emptiness, a dark night of the soul. When this happens, hold fast and weather the storm and know that your inner self is rapidly growing to fill the void that has been created within you. Growth can be painful, even brutal, but it is absolutely worth the effort. watch; don’t only look at the time. When you’ re driving a car, remember that you’re driving a car, don’t just only drive the car. Again, this is the kind of exercise that can be scaled up as you get better at it. Although, it’s not predictable what will be easy and what will be difficult. It will be different for different people." RB notes: this practice is an almost universal tool, very Zen, for learning how to become conscious, to become an aware spiritual being. The vast majority of people who believe or claim to be aware and conscious, to live in the NOW as Tolle would say, are not. They have mistaken the tool for the goal, and ego has caused them to claim victory. The practice of mindfulness will reveal your level of physical world awareness very clearly, as your attention slips in and out of awareness of where you are and what you are doing. This takes effort. I'd like to make it very clear here that the practice of mindfulness is a tool, a means to an end. Becoming aware and present of everything you do in the physical world is a step towards becoming a conscious spiritual being. It is Awareness 101, and not the ultimate goal. The next logical step here, in the process of becoming aware, is to become aware of your thoughts and emotions. Become aware of your thoughts by observing them. See where they come from as they appear and disappear, rise and fall, and begin to see and know the tapestry of your mind and your personal minds eye space. The next logical step from here is to become aware of where your thoughts and emotions and urges and motivations arise from, their source. To do this entails becoming aware of your programming, and your psychology. This will also reveal a lot of your internal baggage along the way. The next obvious step in this process is to begin the process of cleaning house, of reconditioning and restructuring your programming and psychology, so that your state of being 'inside' equals your state of being 'outside'. So your internal processes agree with the external manifestation of your consciousness and state of being. This is a lifelong task. Along the way to the NOW, following this process, you will also become aware of all the life dramas you are involved in. You will find yourself starting and enacting dramas, and also this happening in others. You will see how dramas spread out and snare other people. Ego drama is a disease of the mind that inhibits spiritual growth and limits one to mere programming. Programming and dramas are simple but very powerful blocks to conscious living. They are not easy to become aware of, let alone to change things. Becoming aware of programming and ego dramas is a big step in the right direction.